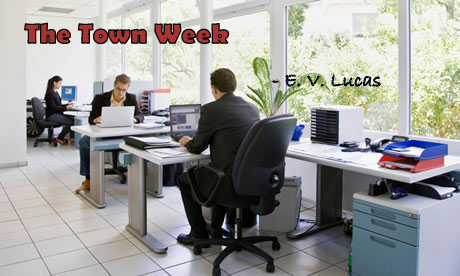 Essays Summary The Town Week Summary of E. V. Lucas' Essay "The Town Week"
In his celebrated essay, “The Town Week” E. V. Lucas very artistically painted various moods and attitudes of the urban people in the seven days of a week. On Monday, people wakes up from their dreamy and lazy languor. The day seems flat as if without any colour and flavour. The fun and relic of the Saturday and Sunday have gone. They look morose and pale. A dull and monotonous life is going to eat them up once again. Reluctantly, people come back to their work places from their village home. The town becomes populated and busy. The local trains are over-crowded. They do not put their interest into their work. So, most of the time, they enjoy gossiping with their colleagues about their week-end spending. The laziness of Monday almost dries up on Tuesday. People become more active and exciting like “glittering star”. They take their job more seriously. The day is pretty good for the businessmen. The week looks more stirring and energetic on Wednesday. It is the favourite day of the author. Friends are easily accessible that day as they remain at their town home. There are matinees on Wednesday. Some delightful papers and magazines generally come out that day. The day being holy, some people do test their luck. Business contracts are usually signed on that day. Surely, Thursday gets some strange features. “It is a good honest day...” The day is really auspicious for the religious-minded people. Parents admit their children into different institution on that very day. It is not the kind of day to take rest idly. To say one word, it is a day of health, wealth, prosperity and wisdom. Friday is a bit flurried and excited. The people get too much busy as they pack their bag and baggage for returning home. The offices look almost barren like a desert. The day is the herald of the Saturday and Sunday. People found relief from the boredom of office duty. Their eyes shine with joy for another two-day vacation. Friday paves the way to Saturday. For most people, Saturday is not a day at all; rather it is a collection of hours. It has no definite character. For some people, it is a day of luxury, and for some entertainment. It is a day we plan for, and therefore it is often a failure. The trains remain fully packed and run late. The shops close too early. Sunday is the happiest day of the week. Different people enjoy this day differently. They like to label this day as their own. A few people engage themselves in domestic duty. They hardly get any scope for entertainment. Only on Sunday, it seems, time runs very fast. It rushes before tasting it fully. But Sunday evening is the most pathetic for the next day will be the Monday. In another sense, Sunday is the week itself, and other days are mere preparation for it.